It's easier to calculate. Subtracting 2 from a number is hardly onerous, but still technically more complex than not subtracting 2. When you are trying to work out what to do during play, you don't care what it cost to get to the point where you are about to play a card: you don't care that last turn you had to draw it. Right now you are going to do something, so the net effect of the thing you do is what is important. There are lots of ways to play cards which mean it won't cost you a draw and a play. 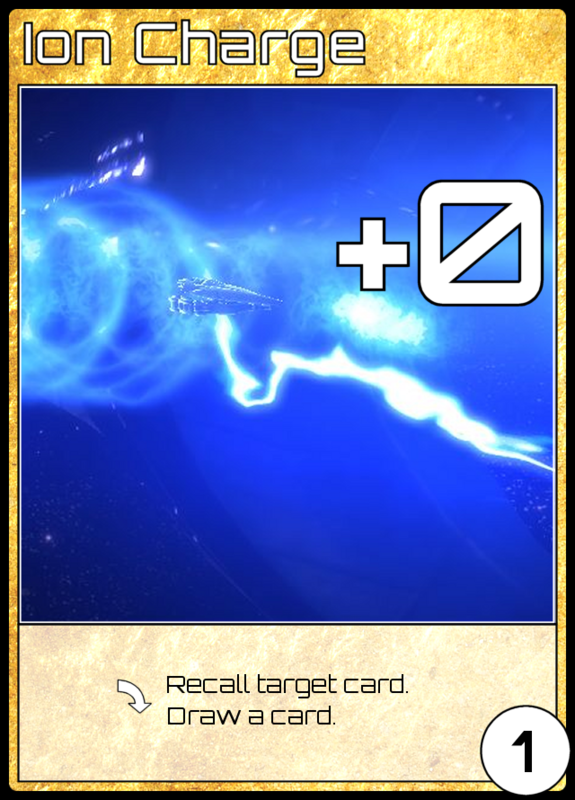 Let's say you play Ion Charge (1ER, +0, played: recall target card, draw a card) to bounce your own Laser Salvo to your hand. If you use the -2 calculation then can you really subtract 2 when you play Laser Salvo for the second time? You had to draw and play it the first time, but the second time (after you bounced it with Ion Charge) you only had to play it: it did not need to be drawn. Subtracting the tempo it cost you to play the card is just a lot more cumbersome. In the last example you could work it out by saying it only cost 1 that play, and thus was a 1 tempo play of Laser Salvo, but this gets inconsistent fast, and hard to keep track of. It is much easier to simply consider the tempo generated by the card itself, and ignore what it cost you to play it. Any tempo which would offset the cost of a card being played should be attributed to the previous play. In the example above, the second Laser Salvo is still simply 2 tempo when you use it to destroy an opponents card. Let's work out the tempo gain from the Ion Charge which bounced it: it put the Laser Salvo into your hand (+1 draw, -1 play), and gave you a card draw (+1 draw), and thus was seemingly only worth 1 tempo - not the theoretical 2 tempo written in the design doc which calculated based on bouncing an opponents card (-1 play for them, +1 draw for you). 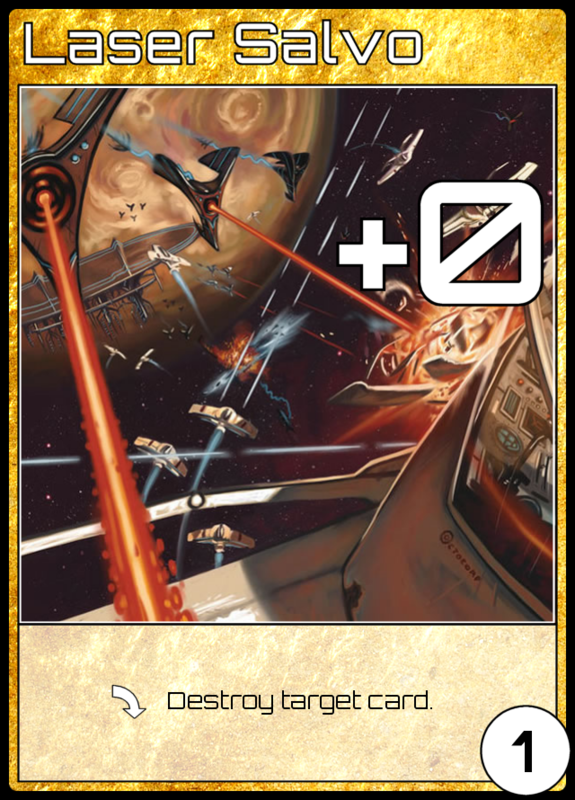 This seems to indicate bouncing your own Laser Salvo is a bad play, which is odd since it looks like such a good play - it's letting you destroy a second card with you Laser Salvo! What gives? Well, perhaps reusing your Laser Salvo does cost you some tempo to perform - if you had two Laser Salvo instead of a Laser Salvo and an Ion Charge, how do the tempo costs to destroy two cards compare? Skip that for now*, however, as there is a bigger problem: we can't work it out from the above paragraph, because it's using the design rules for tempo, and not the play rules for tempo. The design rules are what I've covered until now: the theoretical tempo gain and loss stemming purely from the card itself. When working out tempo in play, during an actual game, you need to calculate based on the actual impact your action has on the game state. I'll look at this in my next post. *Two Laser Salvo cost 2 draws and 2 plays = 4 tempo cost. Laser Salvo & Ion Charge is 2 draws and 3 plays, with the Ion Charge losing you another play (as the Laser Salvo leaves the board) but generating a draw (its secondary effect) - those two cancel each other out, giving a total of 5 tempo cost.